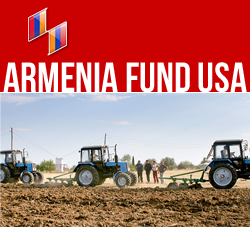 NEW YORK, New York — With its recently initiated reconstruction of the Garegin Nzhdeh and Alec Manoogian streets, Shushi’s two main thoroughfares, Armenia Fund has begun to restore the city’s economic and social infrastructures. The street-revitalization project is being realized through contributions made by the Russian-Armenian community during Telethon 2009. Following the construction of the sewage, water-delivery, and drainage systems, the streets and sidewalks (about 950 meters) will be paved and furbished, and light posts will be installed throughout. The project will be completed with the installation of 1.5-meter-wide lawns separating the streets from the sidewalks. “Prior to the launch of this project, the people of Shushi no longer believed that things would turn to the better in their city,” said Grigori Avanesyan, Director of the Shushi Administration’s Urban Development and Architecture Department. The Alec Manoogian Street is also home to the fire station and the much-visited, 1847-built Hovhannes Mkrtich Church, better known as the Green Church because of the color of its dome.